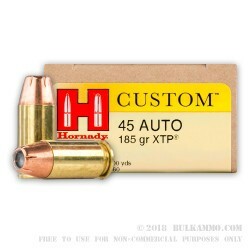 A 200 round bulk case lot purchase of the venerable, proven personal defense and duty cartridge from the Hornady Custom line that features their high-end XTP (Extreme Terminal Performance) projectile in a 185 grain weight. The bullet is a serious offering with impeccable performance and a legitimate history of providing consistency and reliability that is paramount in the duty and defensive markets. This bullet is so good, it has been incorporated into some of the best rated cartridges on the market by a lot of various manufacturer lines. The 185 grain bullet is a bit faster moving without losing substantial ballistic terminality on target. It moves out of the barrel at 970 feet per second which is very good for a .45 Auto. The energy delivery is at 386 ft. lbs. of energy at the muzzle. The XTP has helped to pioneer this concept on the market of a “barrier blind bullet”, that can defeat ordinary ambient barriers, and still deliver lethality on target. This type of engineering has made Hornady one of the finest companies in the space and has cemented their legacy as the innovator in the field. This is a reloadable cartridge with a Boxer primer.